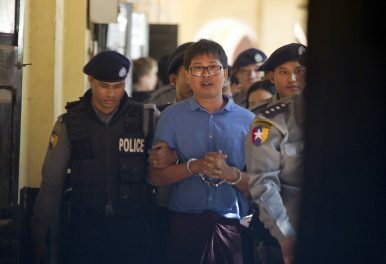 YANGON, Myanmar — Two Reuters journalists imprisoned under Myanmar’s Official Secrets Act filed an appeal Friday with the Supreme Court to overturn their convictions. Lone and Soe Oo, reporters for the Reuters news agency, had been investigating a mass grave in the city of Inn Din. They claim that they were framed by police, who handed them documents, and then arrested them for possession. On January 11, 2019, an appellate judge upheld the original conviction of 7 years in prison for hard labor. This appeal claims that lower court rulings involved errors in judicial procedure. Khin Maung Zaw, counsel for the journalists, said the lower courts did not properly evaluate witness testimony. Observers at the trial described testimony of the prosecution as vague and contradictory. However, one police officer who testified for the prosecution admitted that the two journalists were indeed the target of a sting operation. The case has caught the attention of human rights and free speech advocacy groups around the world. Concerns about the status of press freedom in Myanmar are growing, with 43 journalists arrested wince 2015. *Click Here* to Download the full PDF.